Christmas may be wrapped up, but winter doesn't end on the 26th of December. We've got a cold couple of months still to contend with, and having a hot drink close at hand can make all the difference. That's why, when you're fighting the post-Christmas, pre-springtime blues, this USB Mug Warmer should be your weapon of choice. Simply plug the mug warmer into your computer's USB port and stick your mug on top - the mug warmer will warm your drink to a temperature of around 50 degrees Celsius, keeping your tea toasty and your coffee cosy! Oh, and did we mention the fact that it's shaped like a giant cookie? Because that's another reason why no desktop should be without the Hot Cookie Mug Warmer this January. It looks good enough to eat, although we don't recommend dipping it in your tea. Merry Christmas from Gadget Inspector! We're winding down for Christmas here at Gadget Inspector HQ, but you can still order all of our great gadgets and gizmos over the festive period. If your stack of Christmas loot is a little disappointing this year, you know exactly how to spend Boxing Day - just make yourself a leftover turkey sandwich, fire up the computer, and have a browse of your favourite gadget website! We've got plenty of great ways to bulk up your yuletide haul, so even if Santa gets it wrong, Gadget Inspector will be here to salvage the season! Some quick ideas: the Inflatable Remote Control R2D2 is sure to be your favourite toy long after the decorations have gone back in the loft, while the Combat Creatures Attacknid [no longer available] has everything you could want from a Christmas present - a gun that shoots foam discs, armour that explodes off the legs, and the ability to get two of them together and make them fight. There's plenty more to discover, and we'll be adding a whole host of great new gadgets in the new year, so stick with Gadget Inspector in 2013 and we won't let you down! Until then, though, have a merry Christmas and a happy new year! Important Announcement: Thursday the 20th of December is your last chance to order Christmas presents from Gadget Inspector. Place your order by 1pm today to make sure that your gifts get to you in time for Christmas! Still searching for great Christmas presents? You've not got long left, so here are some quick suggestions - you can still get the perfect present in the nick of time! 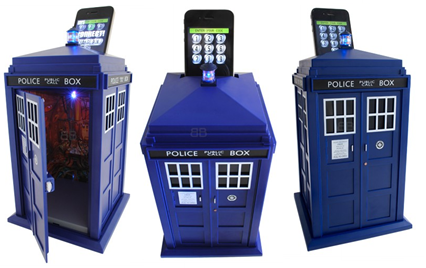 The Tardis SmartSafe [no longer available] is still part of our Gadget Deal of the Week offer. It usually costs £29.99, but if you order your Doctor Who Safe today you can get it for just £19.99! The Inflatable Remote Control R2D2 looks set to be a very popular present indeed this Christmas, but we've still got a few left in stock - if you're fast, your family can still have a squishy inflatable droid to play with on Christmas morning! And if you're looking to fill that last bit of space at the very bottom of the stocking, our stocking sweets might well be exactly what you're after! We've got Nintendo sweets and Star Wars mints; the tins look great and the sweets are delicious! There are plenty of other great Christmas presents here at Gadget Inspector, but whatever you're buying, you'd better be quick! Remember to place your order before 1pm today if you want your gadgets to arrive in time for Christmas! Everybody's focused on Christmas at the moment, but let's not forget what's waiting for us on the other side of the 25th - a long, cold, miserable winter. Wahey! Don't worry though, because even if your Christmas was done and dusted weeks ago, there's another great gift that you can still get your hands on before the wintry, post-yuletide gloom descends: a sumptuous Snug Rug from Gadget Inspector! The Snug Rug is a superb sleeved blanket that's fantastic for people who just want to curl up on the sofa and snooze right through 'til March. 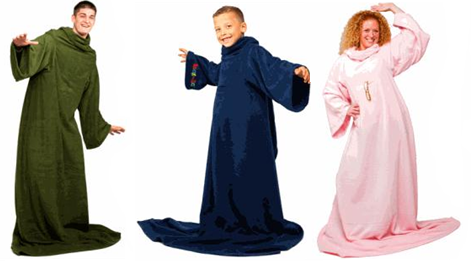 There are many sizes of Snug Rug, including one for kids, one for adults, and the super-thick Snug Rug Sherpa for serious cases of the winter blues! Of course, the one you'll be most interested in right now is the Snug Rug Deluxe, which is currently available as one-third of our Gadget Deal of the Week. The deluxe adult Snug Rug from Gadget Inspector usually costs £24.99, but if you buy one before 21/12/12, you can have it for just £14.99! That's a darned low price for such a toasty piece of winterwear. Of all the great gadgets available here at Gadget Inspector, the SmartSafes might well be our favourites. Not only are they cool and unique gadgets in themselves, but they’re great for keeping your valuables (including your other gadgets) safe and secure. And it gets better, especially if you’re a big fan of Doctor Who. Our Doctor Who Safe is designed to look just like the Tardis, and while it’s not exactly bigger on the inside than it is on the outside, the Doctor Who Safe does have a detailed interior design that’s painstakingly modelled on the ‘real’ Tardis that you’ve seen on TV. To use the Doctor Who Safe (or any other SmartSafe) you’ll need a smartphone. If you’ve got one of those, you simply need to download the SmartSafe app to your phone and choose a four-digit code for your safe. From there, you’ll only be able to open your safe by plugging in your phone and typing in the code. Which is great fun, because the Doctor Who Safe lights up and makes the classic Tardis take-off noise when your phone is plugged in. The Tardis SmartSafe will make a great present for Who fans this Christmas, and this week only, you can get it for just £19.99! It'll look great on their windowsill, and if they’re constantly losing things, then the Doctor Who Safe will be the perfect way for them to keep those things...well, safe. Get yours today!